L-R are and Honors students Rachel Maddox, Heather Ness, and Kourtney Crumpton at the National Collegiate Honors Council Conference. 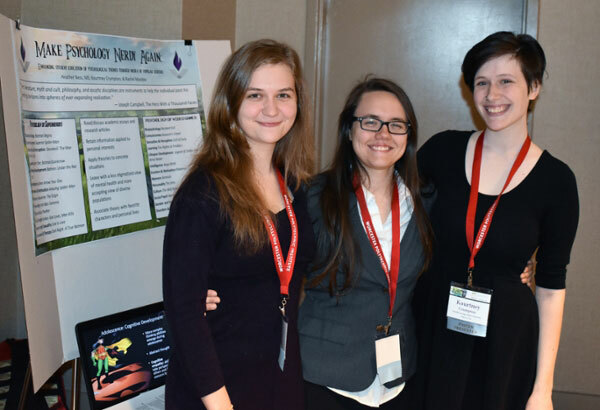 Middle Georgia State University instructor Heather Ness and honors students Rachel Maddox and Kourtney Crumpton put the nerd back in Psychology with their recent presentation at the National Collegiate Honors Council Conference in Atlanta. Ness’s Honors Psychology 1101 class, which explores a broad range of psychological topics as applied to video games and superhero media, will be offered again in spring 2018. Interested students can contact Dr. Clay Morton, Honors Program director, at clay.morton@mga.edu for enrollment information.